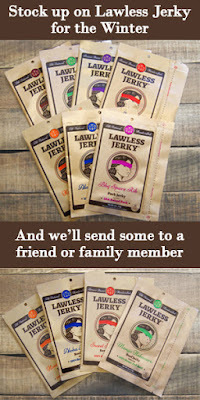 As a celebration of the season, Lawless Jerky is hosting a Cyber Monday Sale that allows you to gift a "Core Four" assortment ($29 value) to a friend or family member, FREE when you order $50+ at LawlessJerky.com. Simply provide the name and address of your recipient on the Cart page before proceeding to Check Out. Click Add a note to your order to reveal the Special Instructions for the Seller box, which will provide the space you need. See below for relevant Terms and Conditions. Applies to orders placed between 12:01am PT Mon, Nov. 28 and 11:59pm PT Tues, Nov. 29. Orders must equal to or greater than $50, not including Shipping cost. Cannot be combined with other discounts, including % off, $ off, free shipping promo codes. Core Four gift recipient must be located in the US or at a US Military Address. 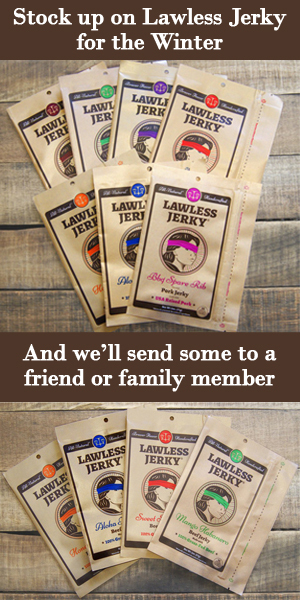 Please direct queries about this promotion to info@lawlessjerky.com. Jerky Dynasty - Everything 10% Off!